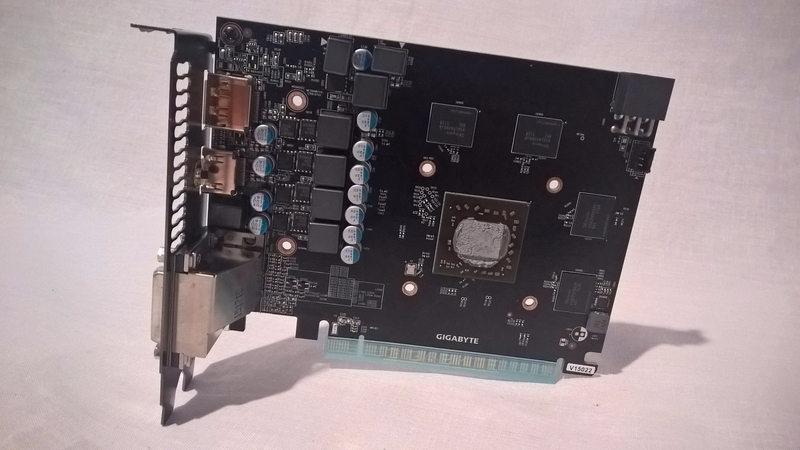 With the current trend towards ‘ITX-ing’ graphics cards, I thought I would have a look at a current generation card – the Gigabyte GV-R736OC-2GD. This card features the AMD R7-360 GPU, with 2GB of GDDR5 and a dual-slot, full height, form factor. This card features the ‘Tobago’ core – also known as the ‘Bonaire Pro’ – a derivative of the Bonaire core first featured, in ‘XT’ form, in the HD7790 from early 2013. The core is based on Graphics Core Next (GCN) 1.1 architecture, which we will detail later on. 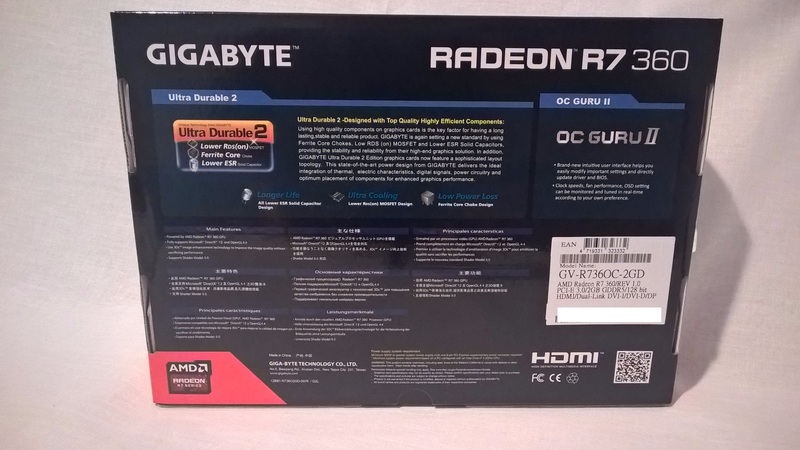 Later in 2013, AMD launched the HD8770, an OEM only version of the Bonaire XT core, with identical specifications except the oddly lower Direct X and OpenCL compatibility. In early 2014, AMD launched the R7 series of graphics cards, and lo and behold, the R7-260 and R7-260X cards featured the Bonaire core – the 260 being a regular Bonaire and the 260X being the Bonaire XTX. Re-labelling GPU cores at it’s finest! Come June 2015, AMD launched the R7-360, and Bonaire made a reappearance – as the ‘Bonaire Pro’ variant in use in today’s review. Over time the Bonaire cores have gone through a few small changes, mostly in memory bandwidth and DirextX/OpenGL standards. 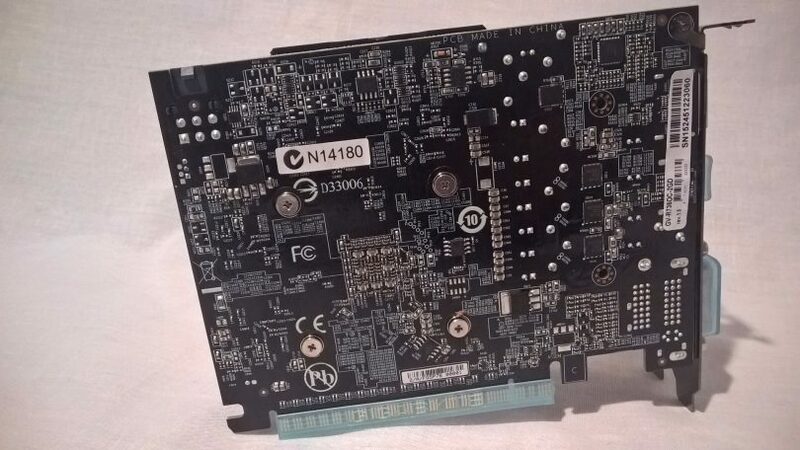 As a sidenote here, the Bonaire core also featured in the workstation grade FirePro W5100 and W6100, as well as the mobile variants of Radeon R9 M280X and the Radeon R9 M385X. All the Bonaire chips have 16 ROPs, a 128 bit memory bus and 2.08 billion transistors. All are manufactured on the 28nm process node and are GCN 1.1. As you can see above, the R7-360 is almost a spec for spec replacement for the R7-260. In the real world, the increased clock speed and other improvements may make a difference, but unfortunately we do not have an R7-260 to compare benchmarks with. The card featured here today is manufactured by Gigabyte. The box it is supplied in is simple but well-designed, and small! An owl features on the front – maybe a stab at ASUS’s Strix line? 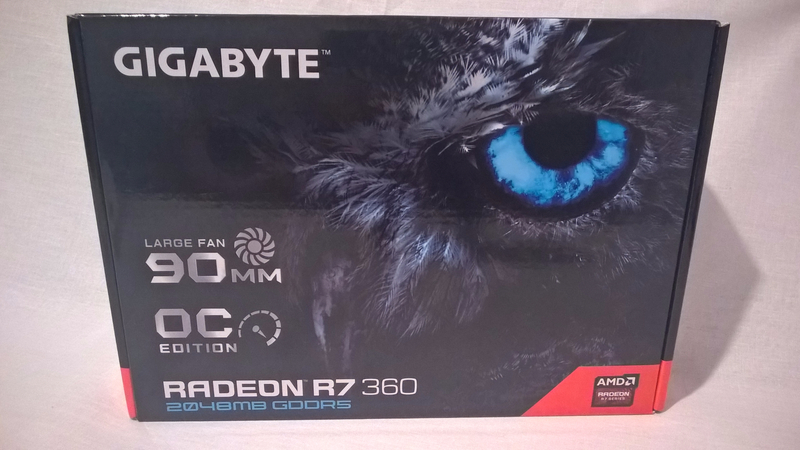 The box also states that this model has a 90-mm fan and is a Gigabyte OC Edition. The back of the box shows off a few features of the card, in quite a few languages. Also shown is OC Guru II, a piece of software supplied by Gigabyte for software overclocking your card. The information shown is somewhat minimal, but how often these days does one go to a shop and look at the boxes for PC parts? Most purchases now are done online or via a salesman who collects the item from the storeroom. 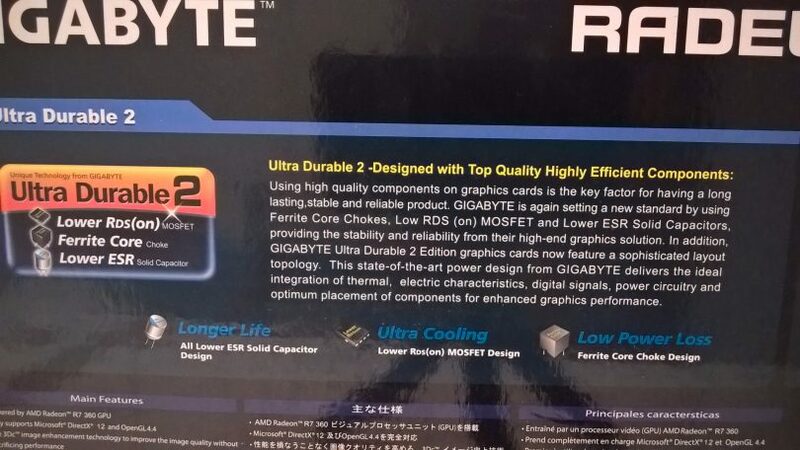 Gigabyte is proud of it’s Ultra Durable technology, and this card features Ultra Durable 2 components. 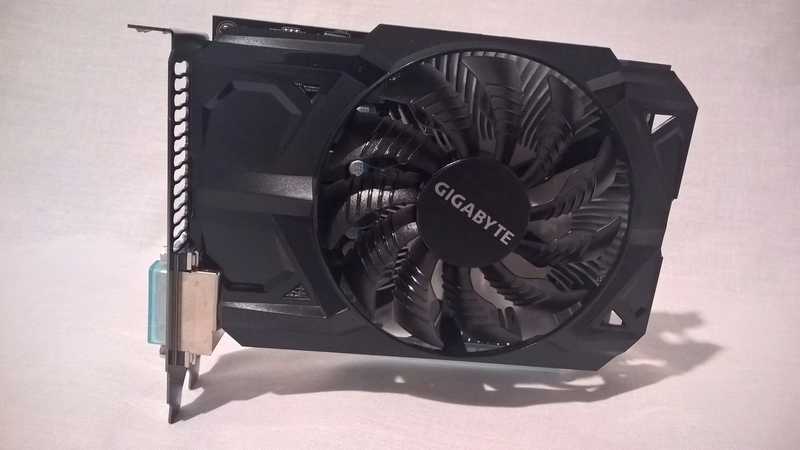 I’m not sure how much this affects the card – but it may have a positive effect on reducing the coil whine so synonymous with graphics cards of the current generations. Opening the box up and we are greeted with… very little. 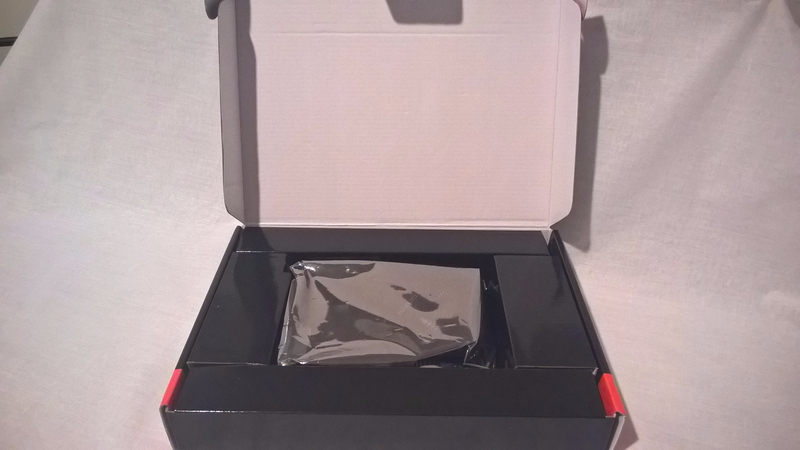 The card, in it’s anti-static bag, sits at centre stage. Simplicity at it’s finest. 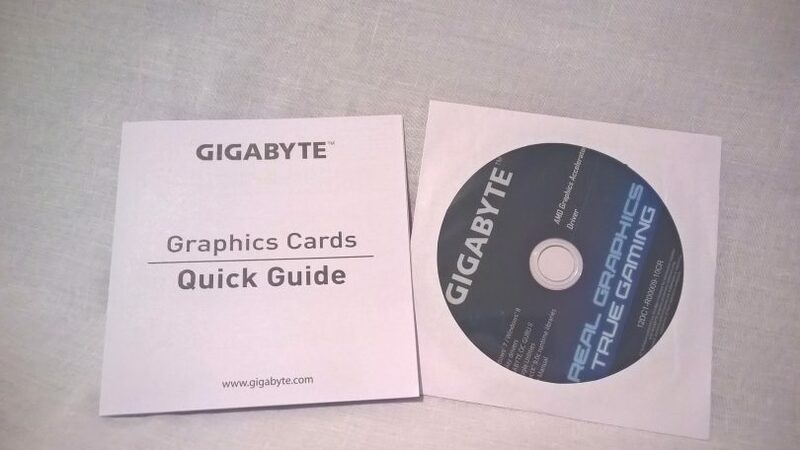 Underneath all the cardboard and the GPU, you will find Quick Start Guide, once again in many languages, and a strange circle made of plastic encased in a square envelope. I am of the understanding that this circular object contains driver software, but I would recommend that you download the latest drivers direct from AMD’s website. 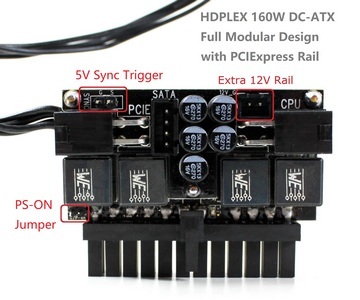 I would have liked to see a Molex or SATA power to PCIe 6 pin power adapter included – some power supplies may be lacking in such niceties. Here is the Gigabyte R7-360 2GB OC in all it’s tiny glory. You can see here the 90mm fan, which appears to have slots formed into it, quite probably for airflow and noise considerations. The shroud just covers the face of the card – it does not extend far down the sides of the card, leading to an open air style heatsink. 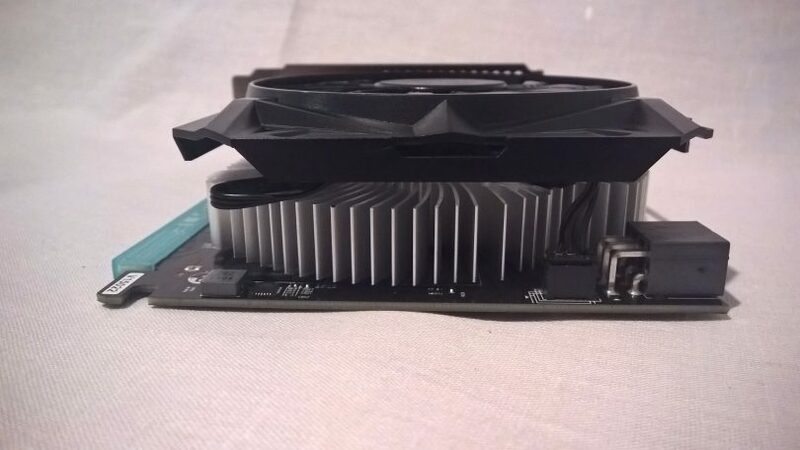 This style is good for GPU cooling, but not good for those of us here at SFFn with small systems – any heat exhausted rather than re-circulated is a good thing. You can also see the card’s diminutive size – 159mm long. On to the rear of the PCB. The PCB used in this card is a proper black PCB, none of that brown looking stuff you see on cheaper cards or motherboards. There are no RAM chips on the back here, just some power delivery hardware, logic and the mounting screws for the cooler. I would have liked to see a backplate on this card, but as this is a low-mid range card, chances are that won’t happen. When the R7-360 was launched, there were no reference designs (apart from a few demo units), so each different R7-360 model will feature a different design. This does prevent the possibility of full cover waterblocks. Ports! This card has em. Featuring an HDMI port, a DisplayPort (full sized), a Dual-Link DVI-I port and a DVI-D port. This covers nearly every monitor connection standard at present, leaving only VGA out – but that is easy to fix by using an adapter (not included) on the DVI-I port. A small amount of ventilation is achieved on the back here, but it is minimal as the card has an open shroud, and thus the air is not forced in this specific direction. Plus the shroud blocks half of this vent. Now we look at the top of the card, and see the open shroud design. Also to be seen is the single extra power input – a 6 pin plug. 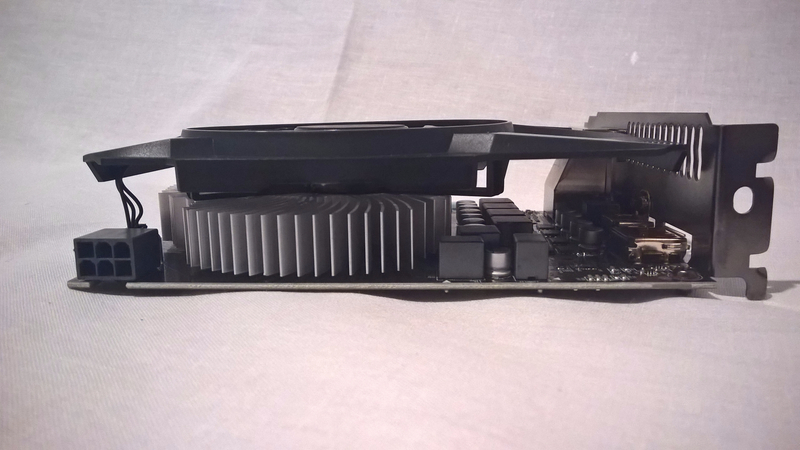 The R7-360 architecture is rated at around 110 watts, so is a little above the 75w PCI express slot limit. The heatsink is entirely comprised of aluminium, with no heatpipes, vapour chambers or other fancy tech to be seen. In this image you can see the reversed power connector – the retention clip is in a cutout in the PCB. I find this to be better than the traditional layout of the power connector, where the clip is on the top of the plug. With some cooler designs it was very difficult to unplug the power when servicing the system (Like the ASUS DirectCU II HD7850). At the front of the card, not much is going on. 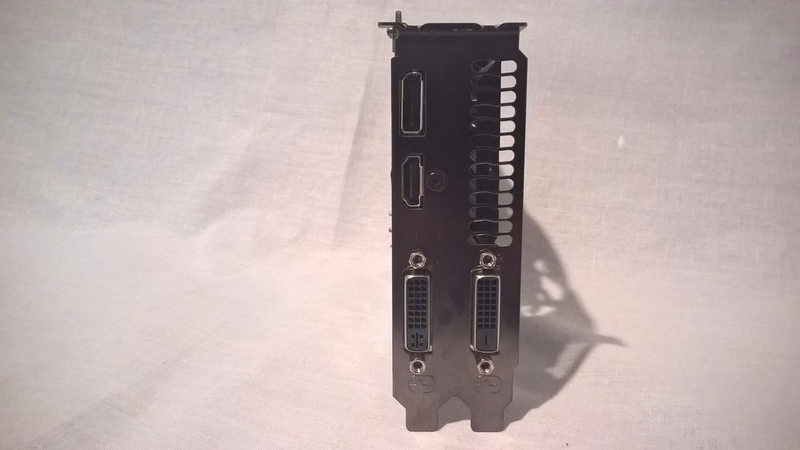 The power connector is at the top of the card – a good thing for short chassis but not skinnier ones. The fan plug is located here, and is a 3 pin. This does mean no PWM control though. The cooler in all it’s glory. The entirely aluminium form is obvious, as is the lack of any direct contact RAM or VRM cooling. The thermal paste is the usual grey goop. There’s not too much to this cooler, and it does remind me of a stock Intel CPU cooler. Maybe Gigabyte could have included a copper slug in this heatsink, like the coolers included with the Intel i7 processors. Now for a view of the card’s party piece – the R7-360 core. As you can see, the R7-360 does not have the venerable HBM VRAM. 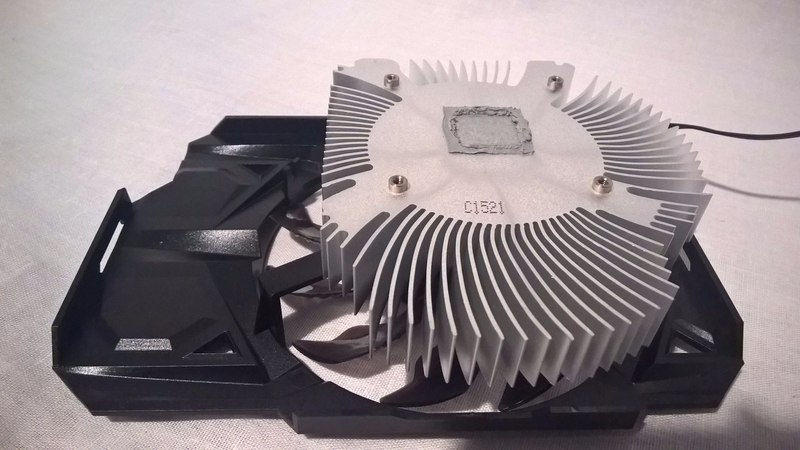 The core is bare silicon, with no protection if you wish to go with an aftermarket cooler. Very few other components appear around the core, leading to a very clean looking PCB. The mounting holes for the cooler are 43.2 x 43.2mm. Around the core we see four VRAM chips – GDDR5 running at 6500MHz effective speed. The chips are made by SK Hynix, and are the H5GC4H24AJR-R0C model. At 1.35V, this RAM can run at 3.00GHz (actual) and provide 6.0Gbps per pin. At 1.5v the modules can run at 3.5GHz (actual) and provide 7.0Gbps per pin. Each chip is running in x32 mode (the modules also have a x16 mode which is not used here), and all 4 running in parallel use the R7-360’s 128-bit memory bus. From the official SK Hynix specs, it appears Gigabyte is running the chips in between both clock speed modes – the tech specs quote the card’s memory speed is 6500MHz. As this is a form of DDR, 6500MHz equates to a 3250MHz actual clock rate. A basic VRM structure is evident – but in reality it is all that is needed for the 110W GPU. We aren’t seeing HBM on the mid-range yet, but in time, that will happen and cards will get even smaller! The R7-360 core was launched at a stock clock rate of 1050MHz. The OC part of this card’s moniker alludes to the 1200MHz clock that Gigabyte has set. With nothing to compare to, it is difficult to ascertain where the card sits in the market, but we will have a go at it anyway. 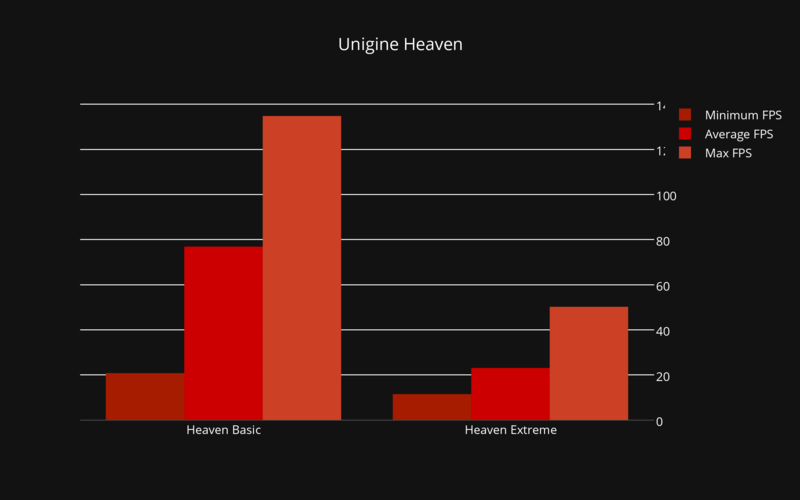 On basic settings, the card achieves an average of 76.9 FPS in Heaven and 57.1 FPS in Valley. Of course, performance does take a hit on higher settings, with 23.1 and 19.7 average FPS respectively. A few games here – all older stuff but still very fun. 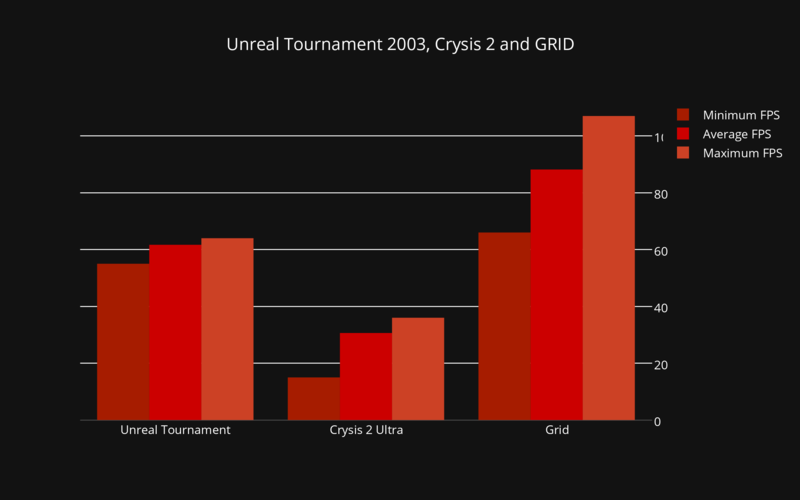 As you can see Unreal Tournament and Grid are easily playable at 1080p, but Crysis at Ultra settings struggles with 30.6 FPS average. The issue here is the 15 FPS minimum – definitely noticeable. 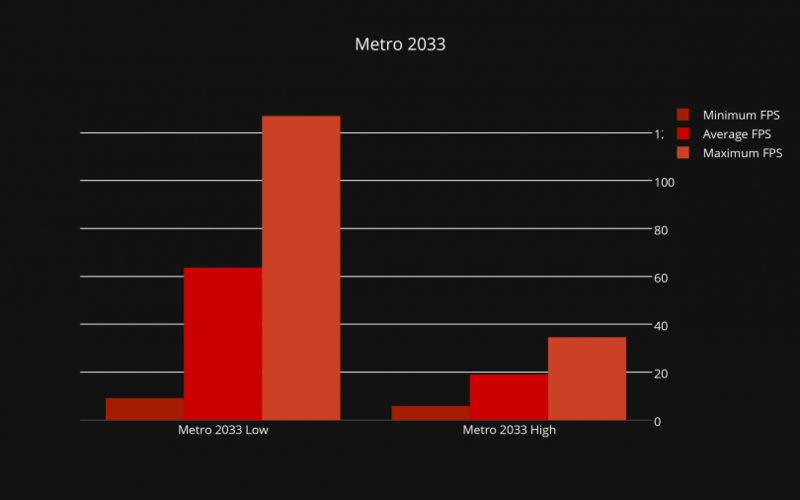 Metro 2033 is an interesting once. On both tests, the minimum FPS dropped to below 10 (9 on low, 5(!) on high settings). Average FPS with low settings is definitely playable, but on high, the framerate is low enough to become unplayable. The tests were conducted in a cramped SFF chassis – The Jonsbo C2. 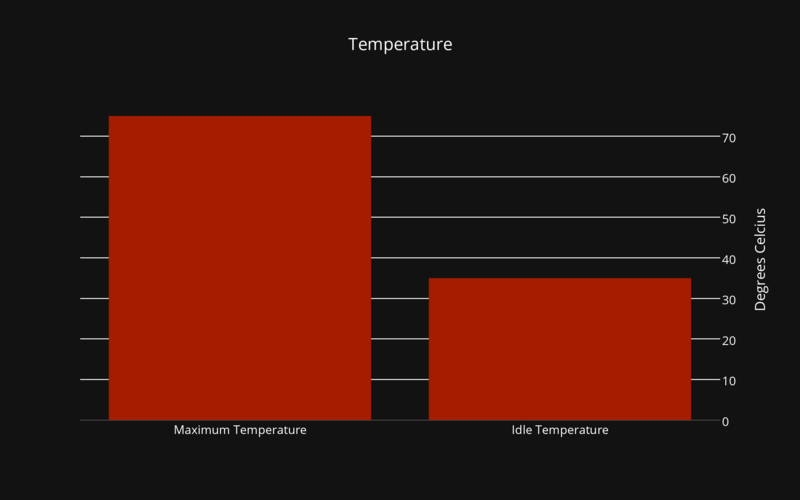 At full load, the card hit a maximum of 75 degrees – this was with a ambient temperature of 18 degrees. Idle was around 35 degrees. After the hands on while taking the above beauty shots, and building this card into my system, I am impressed with the build quality and design of this graphics card. The size is just right for a mid-sized SFF build, and the functionality and port selection ideal for a mild gaming build or a HTPC. The performance was as expected, enough for mid-range gaming but not quite up to playing the latest and greatest games at the highest settings. For the price, it is a really good product, I would recommend it if this is your pricerange. Thoughts? Discuss them in the forums.